Live the Life of a Noble Knight! Hello there, sir knight. Do you feel up for adventure? If so, then there’s some bad news for you; it’s very expensive. Killing the foulest beasts in the land is a brave and just deed, but it won’t make you nearly as much money as you imagine. Fortunately, there is a way to fund your excursions with Knights & Dragons. While you’re still a strong warrior, you are also a leader. Use your vast intellect to build a thriving town that can generate the money and supplies you’ll need to get your monster-killing career underway. Forge powerful weapons and armor, train your skills, and test them against deadly dragons or in duels of honor against your fellow knights. Go forth, sir knight, and seek your fortune in any way you desire! Leading a settlement of people may not be the most glamorous deed, but it’s every bit as virtuous as killing a horrid dragon should be. Your subjects need a strong figure to guide them and make them feel safe in their homes. Prove that you have the ability to accomplish this, and you will be rewarded greatly. Design your town from the ground up. Choose your favorite buildings and lay them out in any way you see fit. 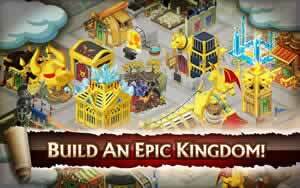 Construct a wide assortment of buildings, including fountains, dungeons, taverns, cathedrals, towers and more. Collect a tax from every building in your village. Build Armorsmiths and set them to work at forging shiny new suits of armor. Fuse existing armor sets at the Fusion Master to turn them into something even more powerful. This thrill of battle is what every knight lives for. When you have had your fill with city planning and politics, you may now set out and right the world’s wrongs with your sword and shield. 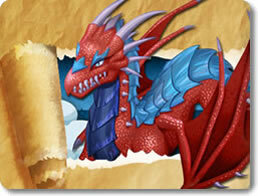 Many fearsome foes lie ahead in your quest, but with training, diligence and a keen mind, you can conquer them all! 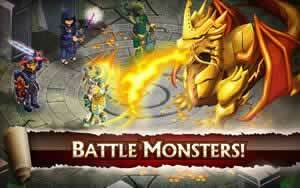 Kill hundreds of distinct enemies, including skeletal pirates, sandworms, giant dragons, demon knights and more. Learn to time your attacks well. Hit them at the correct moments while in the heat of battle to cause more damage and earn even greater rewards. Travel to over a dozen locations, such as the Relic Ruins, Faerie Forest, Misty Marsh, and the Kingdoms of Darkness. Use the spoils of your victories to craft rare and unique suits of armor. Although a knight is strong in both mind and body, he knows how perilous it is to rely on his lonesome all the time. In Knights & Dragons, you will be given multiple opportunities to form valorous friendships and healthy rivalries with fellow knights all over the world. Team up with other players to take on the strongest foes imaginable. Battle other players in Arena tournaments. Pit your skills and equipment against theirs and see who reigns supreme. Engage in friendly duels against your friends. Knights & Dragons is a unique game that blends the city-builder with the RPG to a create an unforgettable experience. You will design and build a city in your own image, train a lone hero in a way that befits your play style, and hunt down a staggering menagerie of gorgeously-drawn creatures in fast-paced battles of skill. Add in the cooperative and competitive multiplayer features, and this should be the last game you’ll ever need.